Instagram users are 58 times more likely to engage with your posts than Facebook users, and 120 times more likely to engage than Twitter users. Businesses that use Instagram correctly can expect to see their traffic and sales go through the roof within days. 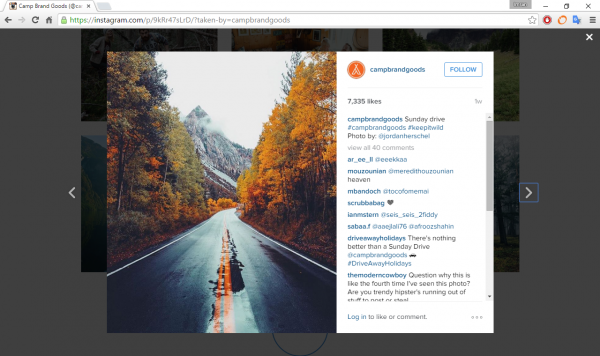 Before you go too crazy with your camera and start posting to Instagram, let’s quickly go through some marketing tips extracted from some top Instagram business profiles. Websta hosts an updated list of the top 100 most followed Instagramers, however, most of them are either celebrities or big brands like Nike or Dior. Let’s look at some of the less famous brands that are rocking Instagram and see what they’re doing right. 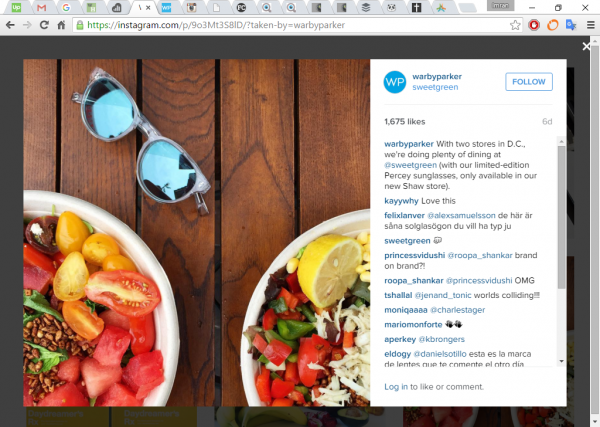 Prescription eyewear and sunglasses seller Warby Parker has 202k Instagram followers and counting. Their photos have thousands of likes and hundreds of shares. The photos and Gifs they share on Instagram don’t look like much at first glance, but they’re really profound. 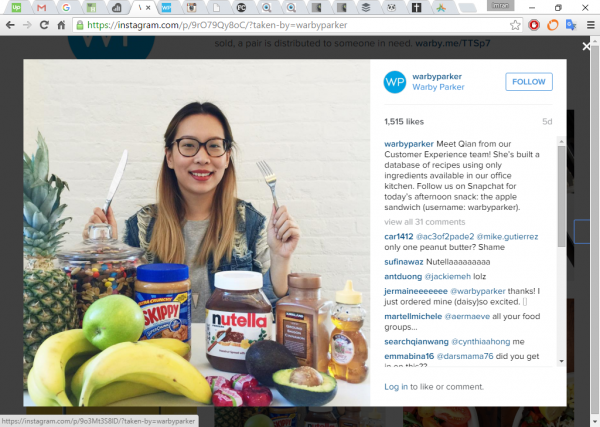 Notice how the photo is not about spectacles, but about everyone’s favorite food items. Yet it brings out the product when you know it’s from a company that sells eyewear. The model in the photo is actually an employee from their “Customer Experience” team—isn’t that awesome to buy your glasses at such a healthy place? Once again, this image is about their employees — this ti,e a fun “inside” look at the company’s culture. And notice the prompt to follow them on Snapchat. The sunglasses in the image above don’t occupy more than 25% to 30% of the space in the photo. Yet they are the only thing that’s shown in full. That’s quite creatively done—a fine balance between what your customers love and your product. The photo steals 1600+ likes despite being a simple product shot. With 120k followers and 3000 to 7000 (!) 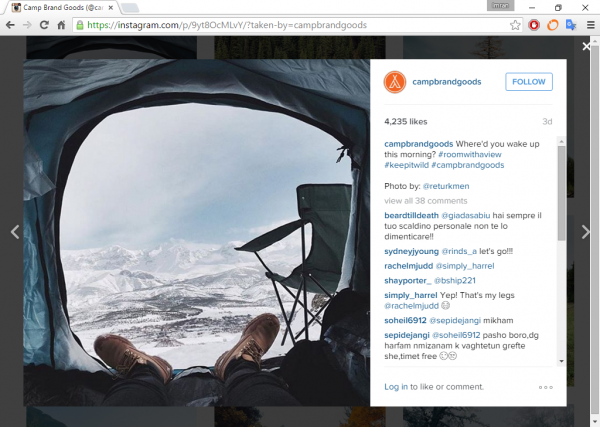 likes on most of their photos, Canadian outdoor “adventure apparel” seller Camp Brand Goods is not doing bad at all. Their profile page says the apparel they sell is “quality tested in the Canadian Rockies.” Let’s look at some of the stuff they post. Hmmm…so, where’s the outdoor adventure apparel in this photo? Instead, the snap is about the occasion when people may use their product. The photo got 7335 likes—great mileage for a Sunday drive! OK, so there’s no apparel and no outdoor in this photo. Why? Because adventurers are people too. They chill out indoors when they’re not out in the woods or mountains. Notice the sun coming in through the window. The description announces the arrival of the fall collection and to “Get it while the getting’s good.” It’s all extremely relatable for customers anticipating the arrival of winters. Guess who the man and woman in the picture are? Finally, we can see the products. But the photo is still not about the products. 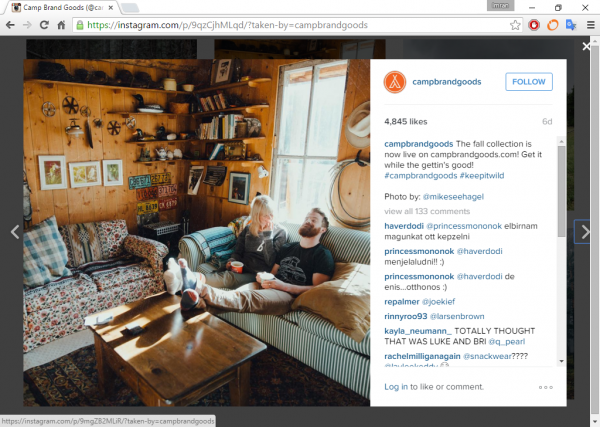 Notice the hashtags #roomwithaview and #keepitwild—very exciting and true to form. There are other great photos of the beautiful outdoors, none of which really features the product. 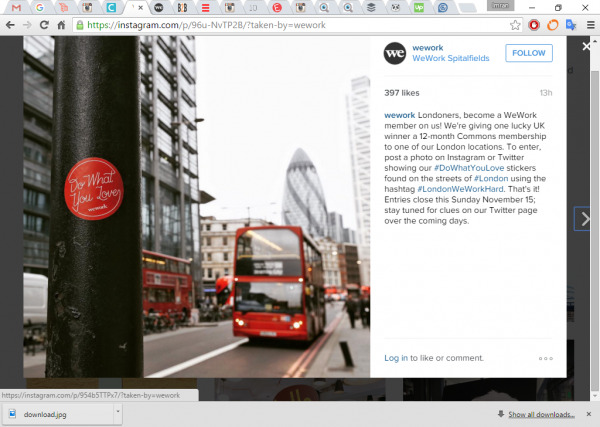 If you think Instagram is not for B2B companies, you only need to look at We Work’s profile. It’s a company that provides workspace and work-related services to all sorts of businesses, from freelancers and startups to large companies and non-profits. 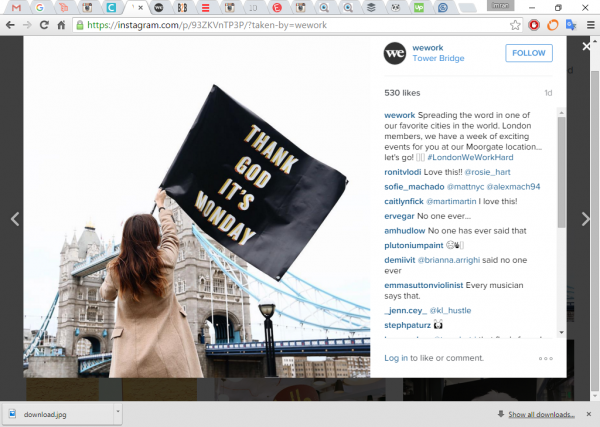 They have 26.5k Instagram followers, not bad for a B2B firm dealing with “work,” of all things. Let’s see what they’re up to. That’s pretty straightforward—a London bus to show their presence in that city. The description reveals they’re offering a 12-month membership for free. This must get them many followers while inducing “product trial. Work hard, party harder. The photo comes from the last night’s party. This photo challenges the way people usually think about work. It reinforces the brand in a subtle but powerful way. 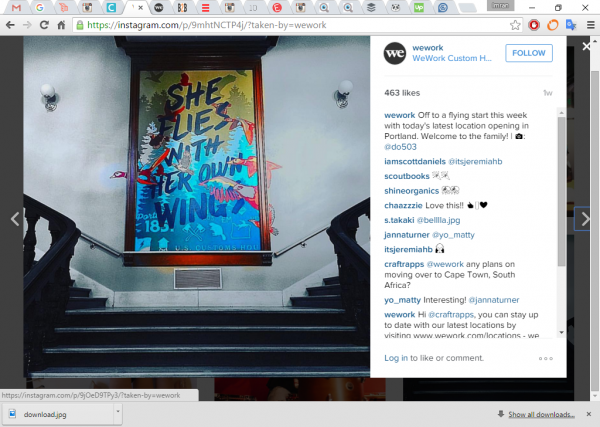 We Work also posts pictures of their offices, which show that even boring places can be made quite exciting. 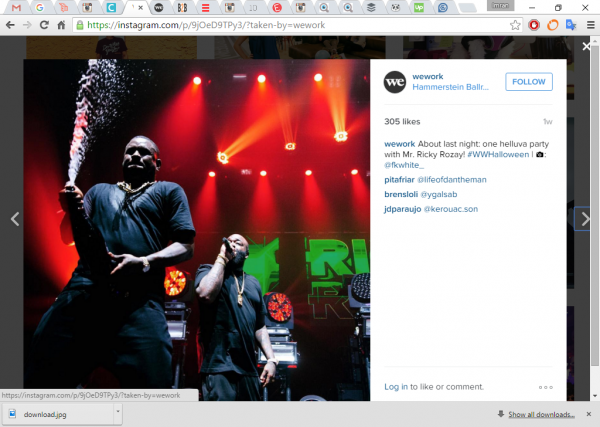 Think about a fun thing that relates to what you do and post photos about that—if work is boring, party is fun! There are many big and small brands that are doing a roaring business on Instagram using some the tips that I’ve just mentioned above. At the end of it, it’s all about your customers. If you know the emotions that will drive them to use your product, and the kind of photos they’ll love, you’re on the road to some serious business growth. All you need is a good DSLR camera, the right lighting, some cool natural backdrops, and a head full of visually compelling ideas. Matt Janaway is a digital entrepreneur and marketer, specialising in retail & eCommerce.